Born in 1975, in Bowling Green, Ohio, Randy Carpenter has had a very long interest in computers culminating with his becoming Vice President of IT Services with First Network Group Inc. While at Bowling Green State University, he majored in Music and Computer Science. Randy also worked for BGSU's University Computer Services, which furthered his computer skills and interest in technology. 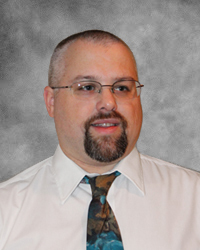 Randy joined First Network Group in 1997 as an entry-level UNIX administrator. Within a few years, Randy's drive and top-end skill set had propelled him to the position of Vice President of Information Services, responsible for administering the servers for First Network Group and its ISP customers. In 2009, the Information Services and Network Services departments merged to form IT Services, which is responsible for all IT operations for FNGi and its customers. This covers network design, consulting, and maintenance in addition to servers, storage, virtualization, and other IT offerings. Randy's vision for FNGi is to provide the best in services, that are able to change and adapt with the times, while keeping our small business "family" atmosphere and attention to detail.